Cemex SAB de CV (CX) is the largest ready-mix concrete company in the world. The company sells roughly 70 million tons of cement, 50 million cubic meters of ready-mix and 150 million tons of aggregates annually. The stock is off 39% since January, but the underlying fundamentals are sound and the shares are undervalued. Concrete is making a comeback it seems. In a recent Instagram post, Floyd Mayweather shared photos of his brand new mansion, which is 100% concrete. Warning! GuruFocus has detected 3 Warning Signs with AME. Click here to check it out. As for Cemex, the company generates 75% of its sales across Europe, Mexico and the United States, with 14% coming from South America and 10% from Asia, the Middle East and Africa. After top-line numbers dropped more than 20% in 2009, the company has seen its sales rise upwards of 50% since 2010. Its profits have gone from red to black, now coming in at 11.1 billion pesos ($548 million) in the last 12 months. More importantly, there is still plenty of room to for the company to grow. Third-quarter revenues of $3.7 billion were up 5.7% year over year, despite missing expectations, and net income was $174 million. Growth has been driven largely by higher volumes and rising product pricing. Larger buildings are conscientiously being constructed around the globe, so while concrete may not rise like pharmaceuticals, Cemex should be able to pace on inflationary pressure to its customers. 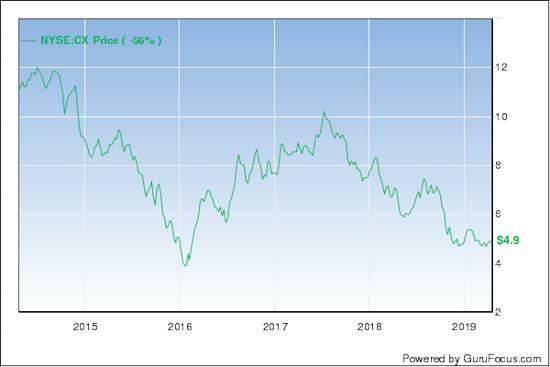 Looking forward, Cemex could earn north of 60 cents per share in 2019. It is already trading below industry average price multiples with a forward price-earnings ratio of 8. At 15 times, the stock would price above $8 a share. If priced on par with book, the stock would be $6.17 a share. This is exactly why investors should own the stock. In the last 10 years, the company's stock has bounced from $4 to $10 on multiple occasions. This is likely to happen again, and sooner rather than later if the company continues to produce solid financial results. Considering it is trading at the low point in this decade-long channel, it makes sense for a short-term trade (24 to 36 months). If it pops above $8 before then, unless something really really positive happens, take profits. Since only 23% of its business comes from inside the U.S., the strong dollar hasn't helped the company, and won't hurt it either. Even if the American economy dips into a recession, construction projects will continue and probably at the same or better rate because housing and real estate will be considered a safe haven this time around. Government and corporate customers constitute the majority of work in developed markets, while at home in Mexico, retail demand is 65%, of which 35% is self-construction. The domestic market makes up 26% of company sales, and the Mexican residential space is flourishing again with housing starts and mortgage applications up on the year. In the company's other two biggest markets, the U.S. and Europe, infrastructure remains a high priority as well. At the municipal level in the U.S., spending on roads and highways has been on the rise, and investors should hope for their own sake that this trend continues. At current production levels, Cemex has over 70 years of raw materials reserves for cement production and over 30 years of aggregates reserves. Will the importance of cement and aggregates in construction diminish? Nope. While other costs fall, Cemex will continue to enjoy a durable competitive advantage. Disclosure: I am not long or short CX.